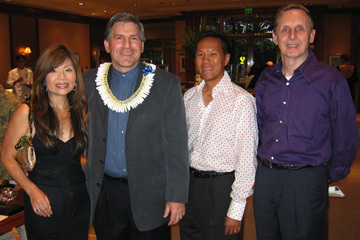 A NEW LOOK AT TIFFANY: John Geppert, second from left, vice president of Tiffany & Co.'s Oahu Market, welcomed Kristen Chan, her husband, Michael Chan and Jay Jensen, curator of the Contemporary Museum, to an intimate party at Tiffany's Waikiki store last Friday. A short list of A-list Tiffany customers and museum supporters enjoyed champagne and heavy pupus from Chai's Island Bistro while perusing Tiffany's first collection of jewelry designs by architect Frank Gehry. The artistic aspect of Gehry's work was emphasized by the continuous showing of his sketches as animated wall art, but, unfortunately, the animated "live graffiti" wall art installation was not for sale. THE LOOK OF GEHRY: Kaitlyn Metcalf, left, wore the earrings and belt from designer Frank Gehry's "Torque" collection at the Tiffany party. Katrina Birkholm modeled items from Gehry's "Axis" collection. FRESH AIR: The Women's Fund's "Tea & Champagne Party" drew so many people to Indigo last week that fund supporters Lani Tani, left, Val Barang and Kelii Simmons stepped outside to escape the crush. 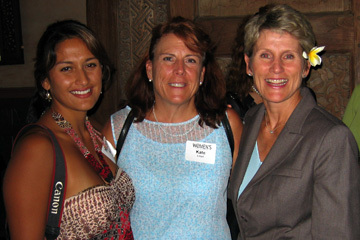 'TEA' TALK: Gwen Pacarro, right, board chair of the Hawaii Women's Fund, talked with her daughter, Noel, left, and Kate Lloyd after the formal ceremony recognizing this years' recipients of Women's Fund grants. "THE TOUCH OF MINK! : Noriko Le, left, was assisted by Louis Vuitton VIP Specialist Mary Chang, as she tried on a multi- colored mink stole at Louis Vuitton Ala Moana last week. Le was one of a short list of customers invited to a preview showing of Louis Vuitton's Fall/Winter 2006-2007 women's ready-to-wear collection. Guests of Louis Vuitton Regional Vice President Dale Ruff sipped champagne while enjoying an informal fashion show. 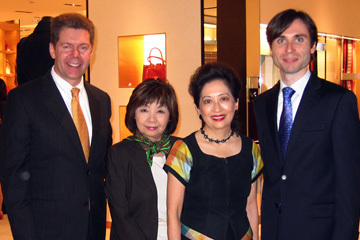 'BON SOIR': Patricia Lee, third from left, honorary French consul, was welcomed to the Louis Vuitton fashion preview party last week by LV execs Dale Ruff, left, Mary Chang and Olivier Barré. Barré is a new face on the local fashion scene; he arrived from France in April to become LV's "product manager.